I didn't get around to rereading this yet but I love your thoughts about the different kinds of magic! I will think of that next time I read. I did reread House of Many Ways to try to remember why I disliked it, and I succeeded. (One word: Lubbocks. Too creepy for words.) 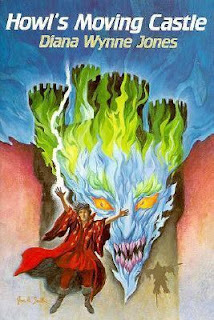 HMC will remain one of my favorite books ever and I am looking forward to the Folio edition, although I wish they had chosen a different illustrator. Thanks again for this event that keeps us fans in touch! That's really interesting about the Lubbock because it seems Diana found him a bit terrifying too but he sort of forced his way into the story and changed it! That kind of character is definitely right on the edge of my tolerance level for scary. And yes, I was a bit disappointed by the illustrator choice too. It was too influenced by the movie and I wanted this version to be more true to the descriptions in the book. 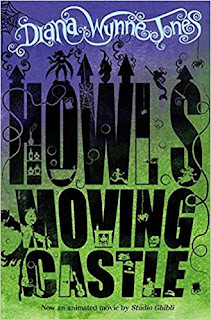 You definitely see the change in the covers when the movie comes out and, though I love Miyazaki's film, it's not the same as the mental pictures when you read. Interesting that you see Marie-Alice Harrel's illustrations as being influenced by the movie, because I didn't see that. Her pictures aren't the way I imagine either the castle or the characters, but I do love the expression on Sophie's face when she's talking to Mrs. Penstemmon. I seem to have gotten confused on which artist won. There was one that was very influenced by the movie and I thought she was the winner. Marie-Alice's drawings are definitely different from my imaginings too! I'm posting a review of my HMC reread on Tuesday so won't say too much now, but I did so enjoy your thoughts on degrees of magic in it. 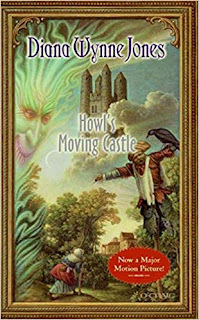 I shall be mentioning closet allusions to The Wizard of Oz, whether Sophie appeals to male readers as much as Howl appears to appeal to female fans, and, of course, the Welsh dimension (in a nod to the Wales Readathon or Dewithon). I will however here say how much I revelled in this reread, not only the familiar stuff (which the Ghibli film I thought was close to) but also the finale which like many DWJ endings defied absolute logic and yet was quite satisfying. I look forward to it, Chris! And yes, I almost talked about the ending today. I mean, there were two pages of literally every character summing up their whole plots in just a sentence or two, even talking over each other. Could there be anything more DWJ than that?! And Howl and Sophie are ignoring everyone! That was a masterful scene; not many writers could have pulled it off. Yes! It's so very visual even though it's just a string of broken dialogue. It's great! 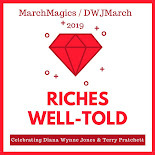 I do love how many kinds of magic there are in this book -- and I think DWJ does that fairly consistently throughout her books? I remember in Witch Week, there's a whole thread about how different people have different kinds of magic, that can be as individual as a fingerprint. 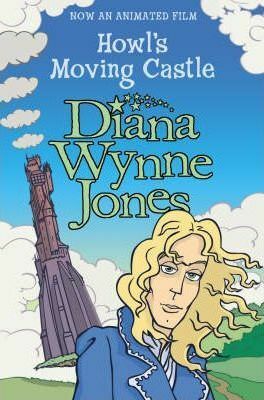 It's a neat idea, as if magic is like writing -- you can always tell a DWJ book when you read one! True. I was just rereading Year of the Griffin and thinking that it's the same non-system system in there too. Anything can be magic and almost anyone can do some sort if they try. I think that it's like Jenny said above, she is consistent with her inconsistency over all of her books so we know that this is DWJ's system and we love it even if it IS a big mess. :) And yes, it makes it feel much more likely that magic could be hiding somewhere here in our world because it seems to be lurking everywhere!